Introduction: This study demonstrates the feasibility of using a miniature robot platform to perform complex, single-incision, minimal access surgery, including colon resection and Nissen fundoplication. Open surgical procedures are highly invasive; single-incision laparoscopic surgery is complicated by instrument position and lack of triangulation. Using minimally invasive techniques with miniature robotic platforms offers significant clinical benefits. Methods: A miniature robot platform has been designed to perform advanced laparoscopic surgery with speed, dexterity, and tissue handling capabilities comparable to standard laparoscopic instruments. The robotic platform includes a dexterous in vivo robot with vision and lighting capabilities and a remote control surgeon console. The basic design of the robot consists of a central body, and two arms that extend and rotate. Each arm is connected to the body with a two degree-of-freedom shoulder joint. The arms are fitted with either a grasper or cautery. This robot, with four degrees of freedom for each arm, has the equivalent manipulability of two laparoscopic instruments working through standard trocars. In addition, multiple robots can be inserted through a single incision, rather than the traditional use of four or five different ports, to provide additional capabilities, including retraction and supplementary visualization or lighting. Results: The efficacy of this robot has been demonstrated in a non-survival, porcine colon resection. Following insertion, via a small abdominal incision, the robot was positioned and a segment of the colon was dissected. The resected colon and robot were then removed through the same incision. 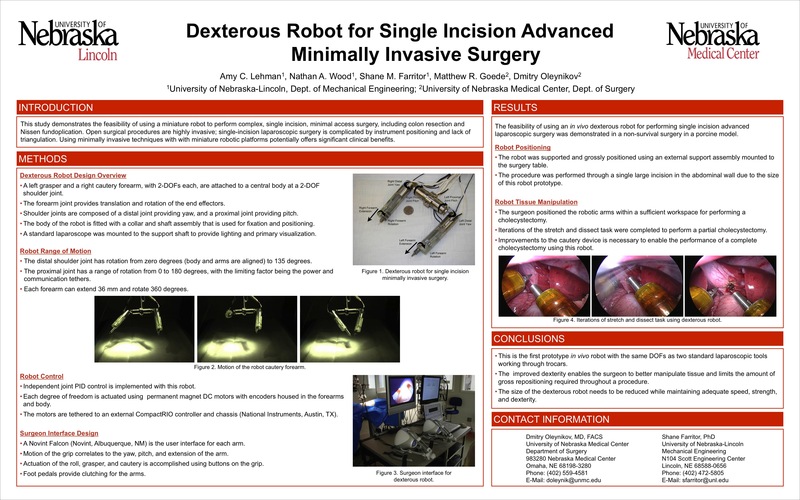 Conclusion: This study demonstrates the feasibility of using a dexterous robotic platform for performing single incision, advanced minimally invasive surgery.